Generate Project is on-demand radio, music portal and blog. 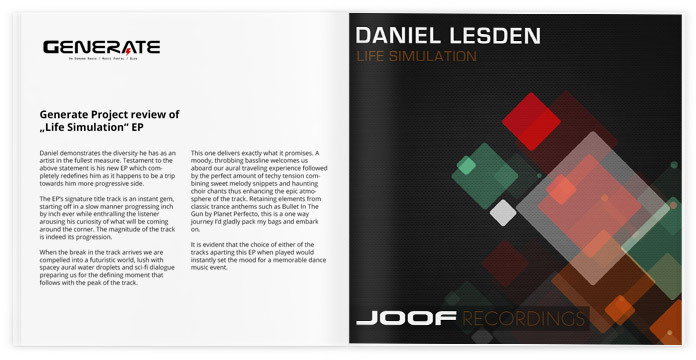 Stuff writer Kostas Voulgaris reviewed Life Simulation EP, Daniel’s latest release on JOOF Recordings. The EP’s signature title track is an instant gem, starting off in a slow manner progressing inch by inch ever while enthralling the listener arousing his curiosity of what will be coming around the corner. The magnitude of the track is indeed its progression. When the break in the track arrives we are compelled into a futuristic world, lush with spacey aural water droplets and sci-fi dialogue preparing us for the defining moment that follows with the peak of the track. This one delivers exactly what it promises. A moody, throbbing bassline welcomes us aboard our aural traveling experience followed by the perfect amount of techy tension combining sweet melody snippets and haunting choir chants thus enhancing the epic atmosphere of the track. Retaining elements from classic trance anthems such as Bullet In The Gun by Planet Perfecto, this is a one way journey I’d gladly pack my bags and embark on. It is evident that the choice of either of the tracks aparting this EP when played would instantly set the mood for a memorable dance music event. Vând Sunete focuses on track recommendations and features everything from new releases to genre classics. This time he reviewed Daniel’s upcoming Life Simulation EP. We continue our travels through the underground side of trance, this time courtesy of the latest release from JOOF Recordings. If a fortnight ago we saw Daniel Lesden make his debut on Digital Om, it’s now time to change labels as he returns to JOOF with the brand new Life Simulation EP. Let’s take a closer look at this double track material. Starting things off, the title track boasts a distinctively prominent base, which gives the entire ensemble a much heavier feel. The heaviness lifts as the break nears closer, with FX and melody teases aplenty, and a fitting vocal sample to boot. Centering around the concept of intelligence and how it influences one’s ability to perceive the future, the sample acts as a nice transition into and from the breakdown. The break is expansive, with a near surreal feel to it, and a goose bump — inducing return of the lead synth. Seeing as trance is predominantly about the ratio between tension and release, Life Simulation has sufficient crescendos and releases to satisfy even the pickiest of fans. If you are to look at life as a series of ups and downs, the choice of title becomes entirely justified. It took me a couple of listen — throughs to connect with this one, but once I did, it was tremendously enjoyable to listen to. As opposed to its companion track, One Way Journey puts a slightly stronger accent on the atmosphere, with a haunting pad-laden and melodically accented journey towards the break. With a slightly shorter ‘breather’ period than the lead track, this one also does away with the vocal sample, instead letting its FX-rich psy influences shine through. The final surprise is that sneaky gated syth which makes an appearance in the track’s second half. It’s probably my favourite part of One Way Journey, and the reason why I slightly prefer this one over the other. Preference aside, they’re both very well constructed, with elements that should please the underground crowd. No matter which of the two has gotten your attention more, you’ll be able to add it to your collection starting February 23rd, from Beatport. A couple of weeks later, it’ll come to the other digital stores, in case you’re a bigger fan of those. On Sunrise Sessions, YourEDM find tracks that best exemplifies the chilled, low energy vibes of early Sundays to start your day off on the right foot. We want to show you what many are missing and help you discover an entire ecosystem of music that’s waiting to be explored. Not to be held down by genres, we look into music in a variety of styles, including Progressive, Deep House, Ambient and even tracks that aren’t a part of EDM! Every week, we unfold a wide variety of artists ranging from established, well known names to producers who purely reside in the underground. As one of the hottest upcoming talents of John 00 Fleming‘s illustrious underground Trance label, JOOF Recordings, it was only natural that Russian Psy wonder Daniel Lesden quickly rose up the ranks by continuing to smash it on every release that he conceives, both within the Psy Trance sound and beyond. We last caught up with Daniel back when he released his remix to Christopher Lawrence & Jonathan Allyn‘s single entitled The Human Element, and since then, has unveiled a new, double sided singles EP on Digital Om entitled Mysteries Of Time and Thru The Stars On Autopilot, as well as a cheekily deep collaboration with fellow upcoming superstar Mekka with Aurora on Borderline Music. However, his latest release is more of a different outing than what we are used to here at Your EDM, as his newest EP on JOOF explores the deeper section of his multilateral sound with a slowed down 126 feel instead of the usual 135-140BPM Psy madness that we are accustomed to. Smooth, simmering Psy basslines are offset by a cavalcade of swooping pad work, twinkling background noises and a neat, futuristic percussion section that adds drive and power to the otherwise low-paired atmosphere. While the A-Side is quite impressive in its own, unique creation, we here at Sunrise Sessions are more inclined to favor the B-Side of this release entitled One Way Journey because of its dense, creamy melodies and intuitive, detailed conversations within its own, intricate instrumentations. We find this new sound to be a deeper side of Airwave‘s current sound with a modern twist of sprightly sewn creativity integrated into the mix, and while there are other artists that are actively exploring this style, we find that Lesden‘s depth and total expansion of thematic characterizations actively trumps what is currently being created. In One Way Journey, smooth, simmering Psy basslines are offset by a cavalcade of swooping pad work, twinkling background noises and a neat, futuristic percussion section that adds drive and power to the otherwise low-paired atmosphere. The blend of textures and sounds are perfectly layered throughout the track to make the listener actively explore the next trend of sumptuously engineered sounds, and the added force of the energetic percussion sections attaches an embodiment of much needed energy to keep things moving in a positive direction. While his main prerogative in One Way Journey is dedicated towards streamlined rhythm and contextualization, his luminous breakdowns allows a simple reprieve from the constant battering of consistent groove, and aggressively investigates other avenues of mysterious sound melodies, (which in turn resets the counter on the main harmonic sections to allow him to build a mountain of colors in which the listener can actively seek and discover within their own leisure and expertise). 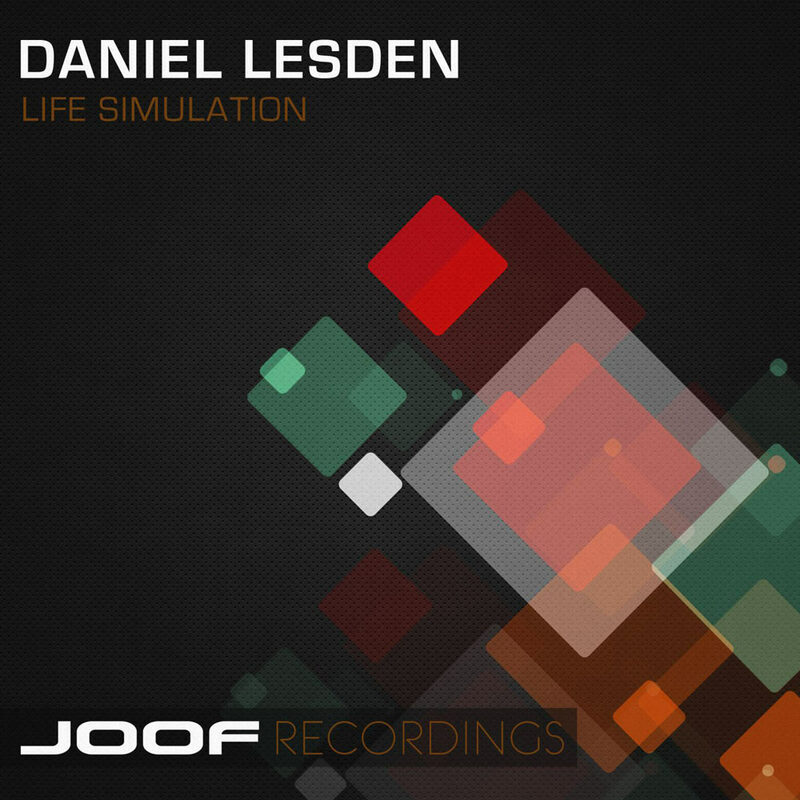 Daniel Lesden‘s single of One Way Journey will be out tomorrow on JOOF Recordings via Beatport, so make sure you purchase a copy and support real talent! Also make sure to check out the A-Side of this release entitled Life Simulation! I’m excited to reveal previews of my next EP which is coming out next week on JOOF Recordings. After receiving a huge feedback on my deeper tracks released back in 2014 as a part of Chronicles Of The Universe album, it was natural for me to proceed working on this direction. Life Simulation is a 2-tracks EP on the edge of Progressive, Trance and even House blended together. Unlike of my PsyTrance releases, these tracks are not clearly made for the dancefloors, but just the way how I express myself as a musician.